India, the third largest producer as well as consumer of steel, as an industry accounts for almost 2 percent of India’s GDP. This industry also has the highest debt exposure with local financial institutions. Steel industry is important for the country because it has one of the highest economic linkages in overall GDP. Steel has an output-multiplier effect of around 1.4 times on GDP, so if steel industry grows by 1 per cent, its proportionate impact on GDP would be 1.4 %. 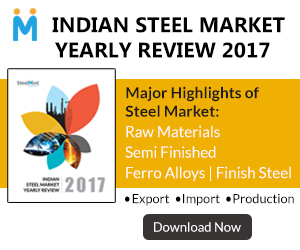 In 2016, India retained its position as the fastest growing major steel economy in the world. Now India envisions doubling the capacity to 300 million tonnes. The Government of India has come up with the new National Steel Policy with an aim to support the domestic steel industry. The policy projects crude steel capacity of 300 million tonnes (mnt), production of 255 mnt and a robust finished steel per capita consumption of 158 Kgs by 2030 – 31. 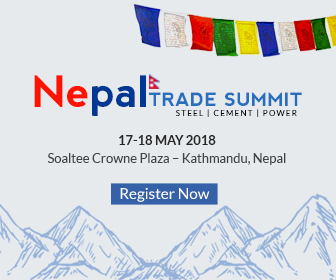 The key features aim for development of globally competitive steel manufacturing capabilities; cost-efficient production as well as domestic availability of iron ore, coking coal and natural gas. The governments of India and Karnataka would require solving the issue of mining cap with honourable Supreme Court to permit the mines in Karnataka to return to their full capacity which had been reduced as a result of the honourable SC imposing a cap on the same. With the new electronic monitoring system, satellite based Mining Surveillance System and transparent system like TAMRA (Transparency, Auction Monitoring and Resource Augmentation) issues like over exploitation and illegality in mining have been mitigated. Further, the government is now well equipped with a huge corpus to the tune of INR 11,800 crores (in the Karnataka region as a result of CEPMIZ (SPV)) levied in the mining districts meant for environment and related activities towards the damage caused during the hey days of the industry. With such huge cash pile in position the fund can very well lead to restoring environment and improving mining infrastructure in the state which will support increased iron ore availability to the steel mills. Iron ore prices in both domestic as well international markets have buckled down and are likely to continue in a downward trend due to oversupply in the global iron ore market. Miners across the globe are trying to reduce costs to remain competitive. An impetus to mutually benefit both the industries is, to allow miners to operate to their full capacity in all states across India to benefit from economies of scale to reduce fixed cost. Secondly, as far as coking coal is concerned, the government is already looking to expand the domestic coking coal production tackling the supply side of the equation in the longer term. While the new steel policy talks about setting up more coal washeries and investing in exploration of coking coal, research and development should progress to make use of all grades of Iron ore available in the nation. The steel industry therefore should look at enhancing and adopting latest technology in the plants to consume all grades available domestically. 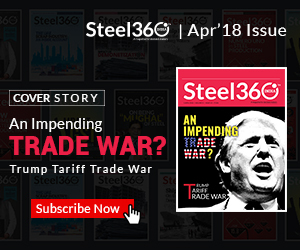 India has really competitive advantages in steel and the new policy recommendation to source raw material from secondary markets such as scrap, many believe, will to some extent fritter the industry. Few manufacturers have even expressed concern that by doing this we will be throwing away the scope of creating employment opportunities, while impacting the environment and providing a route to any unregulated / hazardous scrap to find its way to our soil. With India being a mineral rich country having large reserves of iron ore, the question that should we be resorting to scrap as feed for the steel industry, has also been raised. India has a similar geology to that of Australia which produces over 850 Mt of iron ore while our production of iron ore is only 155 million tonnes. What disappoints is that the share of mining in the country’s gross domestic product (GDP) is a little over one per cent. In fact, the sector’s contribution to GDP has fallen in the past decade, in the face of growing domestic demand for minerals. A McKinsey report says mining has the potential to create six million new jobs and contribute an additional USD 47 billion to GDP by 2025. Mining jobs get created in the most backward districts of India’s poorest states. India has the fourth largest reserve of iron ore. As per Indian Minerals Year book 2014 published by Indian Bureau of Mines, India has 28.5 Bt of iron ore resource. From 2000 to 2010, India has added 6.5 Bt of resources which translates into 650 mnt each year. Assuming we take the same rate of growth in resource addition, India’s total resource base will reach an estimated level of 40 Bt by 2030. If we consider state-wise resources, at the current production rate if we can exploit the Magnetite resources efficiently our iron ore resource can last for 600 years on an average. Even if we consider only the Haematite resource, the average resource life for each state comes at 185 years at current mining rate. The other aspect that has to be looked into for making steel “affordable” to common public, is to reduce the tax burden on the raw material (both Centre and State). Coking coal is taxed at 2.5% Import duty, this coupled with the Rs 400 per ton of Clean Energy Cess imposes a substantial burden on the Coal cost for steel companies. Further to this, the cascading impact of taxes imposed on Iron Ore in the form of royalty, SPV Fund (in Karnataka), Goa Permanent Fund (in Goa) impose further cost on steel industry. The cumulative cost of these taxes is approx. Rs. 2,000 per ton (based on the fluctuating prices), almost equal to the conversion cost of RM to Hot metal in a blast furnace. These taxes are not permitted to be set off even under GST, thereby doubling the effective cost of making steel from the raw material. Removal of these costs alone will turn around a number of steel companies in the red currently. A point to ponder is when countries like Japan and Korea and to a great extent China which are dependent on imported iron ore and coking coal can sell cheap but quality steel products to India why is it that Indian steel companies which can buy iron ore at much cheaper prices in the domestic market need protectionist measures from the government. Hence, Government policy should be more oriented towards making the steel industry inherently competitive by making them invest in R&D and less dependent on controlling domestic iron ore price. Investment in R&D by our steel producers is less than 0.5% of sales as compared to 1-1.5% by the Japanese and Korean steel makers.